PetroChina Jilin Petrochemical, a subsidiary of the Chinese petrochemical giant PetroChina, reduced the price offers of acrylonitrile (ACN) in China for the fourth time this month, now by 1,000 yuan (CNY) or USD143.9 per a ton from the previous level. Indorama Ventures Company Ltd (IVL), the world leader in the production of polyethylene terephthalate (PET), on November 28 announced force majeure circumstances on deliveries of products from the PET plant in Rotterdam (the Netherlands) due to a halt in production with technical problems, ICIS reported. So, on Thursday, November 15, one of the lines at this plant was closed with a total capacity of two lines of 426 thousand tons of PET per year due to leakage of hot oil, there were no casualties. Lightweight but exceptionally strong carbon fiber reinforced plastics no longer have to be incinerated or sent to landfill once their useful life has come to an end. Pioneers of carbon fiber recycling believe that the time is coming for recycled carbon fiber reinforced plastics to take off. Carbon fiber reinforced plastics (CFRPs) bring mechanical robustness with reduced weight to aerospace and automotive components, wind turbine blades, and sporting goods like bikes and tennis rackets. Wind turbine manufacturer Vestas is using CFRPs for wind turbine blades, where reduced weight allows for larger blades ideal for offshore sites and that are more efficient in lighter wind conditions. BMW’s i3 electric car is also employing CFRP components in the passenger compartment and McLaren has plans for a carbon fiber sports car. In the aerospace sector, Boeing’s Dreamliner aircraft relies on CFRP components to reduce weight. Lighter components means greater efficiency and lower fuel consumption during the lifetime of systems, which adds up to lower carbon emissions. 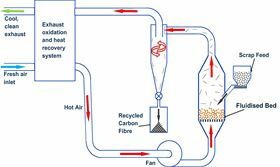 Main components of fluidized bed CFRP recycling process. The figures are mind-boggling: Food loss and waste is an enormous environmental problem. According to the Food and Agriculture Organization of the United Nations’ “Global Food Losses and Food Waste” report, roughly one third of all food produced for human consumption is lost or wasted. Polymers are behind many important inventions of the past several decades, like 3D printing. So-called “engineering plastics,” used in applications ranging from automotive to construction to furniture, have superior properties and can even help solve environmental problems. Just a few hours after WTI Crude dipped below $50, oil prices wiped out losses and started climbing on Thursday after reports that Russia has conceded that it needs to reduce oil production and join a new Saudi-led OPEC cut to balance the market. Earlier in the day WTI Crude had breached the $50 support level for the first time in more than a year, following yet another U.S. crude inventory build that the EIA reported on Wednesday. SABIC is planning to build a demonstration plant in Europe to transform waste plastic into feedstock for its crackers as part of the company’s strategy to further advance its circular economy model for the business, a senior company executive said on Wednesday. SABIC Geleen siteThe new demonstration plant is intended to be built at its Geleen manufacturing site in The Netherlands, according to Abdulrahman Al-Fageeh, SABIC’s executive vice president, petrochemicals. -Is the fashion industry about to have its ‘plastics moment’? With MPs urging clothing brands to disclose impacts, consumers increasingly protesting “fast fashion” and documentaries on the true cost of cheap garments emerging at a pace, edie explores whether the fashion industry is set to have its “plastics moment”. More than a year after Blue Planet 2 kick-started a wave of plastics actions from consumers, policymakers and corporates, the war on plastic is undeniably still high on the sustainability agenda. But in parallel to this rise in plastics action, sustainable fashion has made its own journey from being a topic discussed only by niche bloggers to one which drew the biggest audience in UK history to a select committee hearing just a few weeks ago. CARBIOS announces today the signature of a Letter of Intent (LOI) with KEM ONE for an implementation project, in the French Chemical Valley, of an industrial demonstration plant to secure the value of its breakthrough technology. Oil prices are dropping rapidly, causing oil and gas companies to take a step back. Over the last month, the price per barrel has dropped 20 dollars. “Very quick downward trend in oil and gas over the last few weeks. Herd was saying the other day when oil goes up it takes the staircase but when it does down it takes an express elevator and that’s exactly what we’ve seen.”Kirk Edwards, President Of Latigo Petroleum. Arburg GmbH + Co. K.G. rolled out its Freeformer 300-3X at Formnext 2018 in Frankfurt. The machine does additive manufacturing of three-component parts in hard/soft combinations. Formnext, a major trade fair for additive manufacturing, was held Nov. 24-27. Arburg said it is the first time that additive manufacturing can make complex, functional hard/soft parts using support structures. The Lossburg, Germany-based company also rolled out a new rental model at Formnext. UK packaging supplier Raepak has created a series of product innovations, which is set to reduce plastic waste on a global scale. Three new products have been launched including the new dosing cap, 100% recyclable dispensing pumps and the 100% biopolymer plastic containers. The introduction of the new dosing cap helps to reduce the packaging size and liquid contents. This is because a concentration of liquid can be used rather than larger product volumes mixed with water. The idea behind the dosing cap is a complete reduction in energy used to make the overall product. This helps to lower the carbon footprint and reduce material resources. Loop Industries, Inc. (Nasdaq: LOOP) (“Loop” or “Company”), a leading technology innovator in sustainable plastic today announced that they have entered into a multi-year supply framework with the Coca-Cola system’s Cross Enterprise Procurement Group (“CEPG”) to supply 100% recycled and sustainable Loop™ PET plastic (“Loop™ PET”) from Loop’s joint venture facility with Indorama Ventures Limited in the United States to authorized Coca-Cola bottlers who enter into supply agreements with Loop. Indorama Ventures is a world-class chemicals company and a global integrated leader in PET and fibers serving major customers in diversified end-use markets. Davis-Standard L.L.C. is entering the thermoforming equipment market with its latest acquisition. The Pawcatuck-based maker of extrusion and converting equipment has bought Thermoforming Systems L.L.C. in Union Gap, Wash. TSL makes thermoforming equipment for the North American food packaging industry that can be used to produce a variety of plastic cups, hot or cold lids, food containers, and ventilated or tamper-evident products.